Alright. Let’s get to this week’s book: E-Myth by Michael Gerber. If you have entrepreneurial ambitions of any kind, then you need to read this book. It will teach you one of the most important lessons you can learn if you want to build and own a business, not just have another job: systematization. In other words, if you want to build a business that serves you and your lifestyle–instead of the other way around–then you need to learn how to make it dependent on systems and not people. This is especially true if you also want a business that can scale. And that’s the focus of this book. Pretend that the business you own—or want to own—is the prototype, or will be the prototype, for 5,000 more just like it. That your business is going to serve as the model for 5,000 more just like it. Not almost like it, but just like it. Perfect replicates. Clones. In other words, pretend that you are going to franchise your business. The question you want to ask yourself is this: How can I create a business whose results are systems dependent rather than people dependent? Systems dependent rather than expert dependent. It’s been said, and I believe it to be true, that great businesses are not built by extraordinary people but by ordinary people doing extraordinary things. It’s very hard to find/cultivate and keep extraordinary people. It’s much easier to create extraordinary systems and teach ordinary people to work them. The commodity is the thing your customer actually walks out with in his hand. The product is what your customer feels as he walks out of your business. What he feels about your business, not what he feels about the commodity. What’s your product? What feeling will your customer walk away with? Peace of mind? Order? Power? Love? What is he really buying when he buys from you? The truth is, nobody’s interested in the commodity. People buy feelings. Customer experience, not product quality, is the real “secret” to building a profitable business with staying power. Everyone in business has heard the old saw: 80 percent of our sales are produced by 20 percent of our people. Unfortunately, few seem to know what the 20 percent are doing that the 80 percent aren’t. The 20 percent are using a system, and the 80 percent aren’t. The best systems are usually simple: a small collection of clever but commonsensical guidelines and checklists. In a television commercial, we’re told, the sale is made or lost in the first three or four seconds. In a print ad, tests have shown, 75 percent of the buying decisions are made at the headline alone. In a sales presentation, data have shown us, the sale is made or lost in the first three minutes. First impression is hugely important in customer acquisition. People decide very quickly whether they’re going to consider buying from you or not. 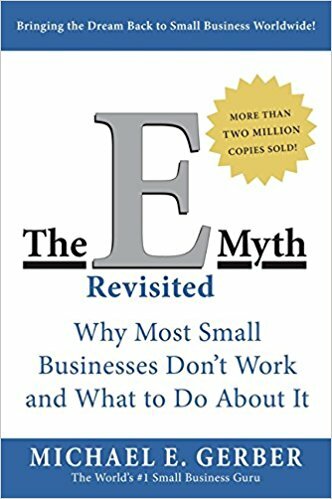 Have you read E-Myth? What did you think? Have anything else to share? Let me know in the comments below!